The most important information the audience can have about this movie is that “Australia,” as the poster says, is a “Baz Luhrmann Film.” Mark Anthony Luhrmann, known as Baz, is the man who strutted onto the world’s screens in 1992 with “Strictly Ballroom,” followed it up with “Romeo + Juliet” in 1996 and then directed “Moulin Rouge” five years later. In just four films over 16 years, his work has become progressively longer and more complex. His subjects have moved from a home in the suburbs to, now, the smallest continent and the largest island in the world. Luhrmann’s style is hyper-real. That’s why Sheehan’s comment is on the money. “Australia” is in every sense an epic. Lady Sarah Ashley (Nicole Kidman) is convinced that her husband is cheating on her, so the headstrong Sarah journeys from London to the remote tropical outpost of Darwin, Australia, to confront him. Her reluctant guide through the vast, unforgiving terrain of the Northern Territory is the Drover (Hugh Jackman), a rough-hewn cattleman as rugged as Sarah is refined. Their profound mutual dislike is tempered by tragedy when Sarah suddenly finds herself caring for a sensitive young orphan called Nullah (Brandon Walters), a half-Aboriginal, half-Caucasian boy adrift in a segregated society that treats him as an outcast. Meanwhile, Faraway Downs, her husband’s cattle ranch, is on the edge of ruin; and the scheming station manager Neil Fletcher (David Wenham) is plotting with the cattle baron King Carney (Bryan Brown) to hasten its demise and take over the property himself. To save Faraway Downs, Sarah must join forces with the Drover and drive 1,500 head of cattle across Australia’s breathtaking yet brutal landscape. Along with Nullah, they are joined by a misfit band of ranch hands and homesteaders, including the alcoholic accountant Kipling Flynn (Jack Thompson), the Drover’s trusted Aboriginal stockmen Magarri (David Ngoombujarra) and Goolaj (Angus Pilakui) and a mysterious tribal magic man known as King George (David Gulpilil). Transformed by the power and beauty of the land and by her bond with Nullah, Sarah falls in love with the Drover. But when the sinister effects of World War II reach the shores of Australia, Sarah and her unlikely new family are torn apart. For the first time, Sarah has something to fight for—and it takes passion, courage and determination as great as the mysteries of the ancient continent to protect the people she loves. “Australia” is spectacularly shot and wonderfully edited. Some of the performances, especially from the Aboriginal cast, are very affecting indeed. Jackman and Kidman are allowed to be over the top because the film is over the top. Luhrmann does not believe that less is more. But this film has a deeply moving moral center. I doubt many people beyond the shores of Australia can appreciate the intensity of the debate surrounding the culpability contemporary white Australians bear in regard to the forced removal of children of mixed race from their Aboriginal families for nearly 100 years. As well-meaning as the policy and practice may have been at the time, they are now seen as a shameful story, akin to the stain of slavery for other nations. Prime Minister Kevin Rudd gave an official apology to the “Stolen Generations” only in February of last year. 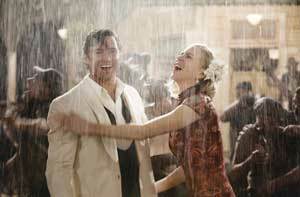 But Luhrmann is smarter than to leave a happily-ever-after ending for Nullah, Lady Sarah and her Drover. King George beckons Nullah back to his tribal roots and ways: “You have been on a journey; now we are heading home.” In doing this Luhrmann is articulating one side of a lively debate about how Australian indigenous people might reclaim their own heritage and dignity. The report of the Royal Commission on the Stolen Generation was entitled Bringing Them Home. It is not by accident that “Somewhere Over the Rainbow” is this film’s unofficial theme song. Apart from the agreeable romance between the leads and the explicit homage to the American western genre in the cattle droving scenes, “Australia” also has a particularly strong mystical resonance. It is also true of Australian cinema, in which we have romantically portrayed the outback as a place of natural beauty, of divine creation or as a challenge worthy of human endeavor (“The Man from Snowy River”). In our outback stories we meet eccentric characters (“Priscilla, Queen of the Desert”), humor and satire (“Crocodile Dundee”) around narratives of friendship (“Gallipoli”), and the triumph of a rugged individual over the geography (“The Man from Snowy River II”) is always at hand. The desert has been for us the locale for stories of violence (think of the “Mad Max” films), hard work (“The Sundowners”) and most especially mysticism, Aboriginal mysticism in particular (“The Chant of Jimmy Blacksmith,” “Jedda,” “Walkabout” and “Picnic at Hanging Rock”). Extending this Jungian reading, Luhrmann marries the Australian canon with an epic style and a mystical quest narrative. Here the wounded heroes (Lady Sarah and the Drover), who are in flight from their external worlds (both characters are grieving), are led by the symbolic mystical child into a lonely place (figuratively and physically), where the reality of the other worlds are taken as seriously as is the importance of living close to the earth. Within this context, our heroes undergo inner battles, purifications and rites of passage within which the split between their conscious and unconscious worlds is healed. The anima (a very feminine Kid-man) and the animus (an equally rugged Jackman) are reconciled as one. Richard Leonard, S.J., talks about Australia and the fantasy films of 2008. This article also appeared in print, under the headline "Down Under, Over the Top," in the February 2, 2009 issue. Richard Leonard, S.J., is the director of the Australian Catholic Office for Film and Broadcasting and the author of .